Covered California’s Bronze Plan covers 60% of your annual medical services on average, and is the least expensive plan available that qualifies for premium assistance. This plan offers a low monthly premium. Also, it gives you the peace of mind of knowing you have coverage in the case of a “catastrophic event”. Without coverage, you could end up with a medical bill in the tens or hundreds of thousands of dollars, but with this plan, the highest your medical bill could reach in one year is $6,800 for one person or $13,600 for a family on the standard Bronze Plan, or $6,550 for one person or $13,100 for a family on the Bronze HDHP/HSA Plan. However, with lower premiums come higher out-of-pocket costs when you need to use medical services like the emergency room, etc. Most services are subject to the deductible. This means that you will be responsible to pay full price for your services until the deductible is met. For example, you will pay full price for x-rays and emergency room visits until you have reached your deductible. The standard Bronze Plan gives you the first 3 cumulative office visits (primary care, specialist, mental health and urgent care visit) for a copay of $75-$105. Note: The HSA Bronze Plan does not include this benefit. The Bronze plans (like all of the plans) includes free preventative care such as annual physicals (including mammograms and colonoscopies), well-baby checkups, and immunizations. Basic pediatric vision and dental preventative services are included at no charge for children 18 and under. Covered California offers 2 Bronze 60 Plans: The regular Bronze 60 Plan and a Bronze Plan compatible with a Health Savings Account called the Bronze 60 HDHP/HSA plan. Bronze 60 Plan – check out this plan for additional limited benefits that are not subject to the deductible. 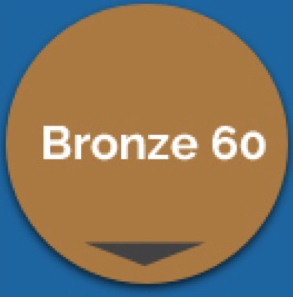 Bronze 60 HDHP/HSA Plan – check out this plan for additional tax benefits. Is the Bronze 60 Plan Right for Me? You want a low monthly premium. You are comfortable with a high deductible, and you mainly want a catastrophic plan. You are not regularly taking costly prescription drugs. Your goal is to comply with the Individual Mandate to have health insurance verses having the richest benefits. Your income qualifies you for a subsidy but you do not qualify for Enhanced Silver Plan. Your income does not qualify you for a subsidy and you are age 50 or over. Note: At this age the cost difference between the Bronze and the Silver plans is often greater than $100. If your income qualifies you for an Enhanced Silver Plan, consider this plan and weigh the added out-of-pocket savings to the premium savings of the Bronze plan. If you typically use a lot of prescriptions, doctor visits, or other medical services, you may want to consider a Silver, Gold or Platinum.